A novel that through its cover page promises to send chills down your spine. Horror is the outlining force of the book with emotions suspense, fear, discrepancy and love being traced. The following people who are a part of this book have contributed just the right thing. 1. Sagher Manchanda : He makes the novel a page turner. Right expressions, amazing literature, high creativity and imagination, topped with some suspense and mystery - he knows the recipe of a perfect story. His stories provide a new insight into the writing and human world. He amazes with his writings, leaving in him complete awe of him, and if you are an avid reader, he is just the right pick for you! 2. Nalini Srivastava : Her stories are borrowed from real life incidences , some of which mirror the reality of human life and relationships. The literal expressions are good, some stories will touch your heart. But the majority of her stories lack horror and rather focus more on human nature. That is the only drawback of her writing. Some stories do offer paranormal experiences but lack the real list. 3. Nikhil M Katkar : As a newbie in the writing industry , Nikhil impresses with choosing the right subjects and right content. Her stories depict versatility on new grounds. The portrayal of Indian beliefs and ethics also make his stories captivating. 4. Shail Raghuvanshi : Shail's stories are too based on common day activities and have a slight tinge of horror only as the end. The characters are strong but could have been stronger. She offers real life perspectives and evokes interest. 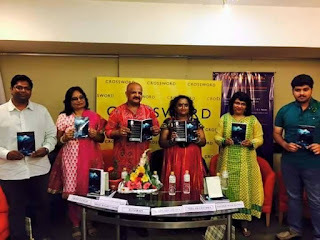 5 Neelam Saxena Chandra : Neelam's stories are more of revenge - seeking - souls rather than horror. Most of the endings are happy but surprising. Human ethics are the reckoned base of horror of all her narration. She captures your attention and makes you anticipate many more stories. Over all this book is a one time read . However some stories can be read again and again. 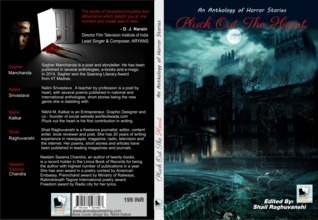 The book comprises not of only horror but many other genres which it will redefine. About the BookPluck Out The Heart is something beyond an anthology; It is a unique venture by five authors. Based on the horror/dark genre, this book stands out to be a variation in the approach to scary tales. Just as it will manage to run a long nail down your freezing spine, Pluck Out The Heart is manicured with an intention to tell newly thought stories to the readers, page by page. The macabre wave of the revenant has been woven through the emotions in each story, as the characters in them are created to touch your heart and their darker part is sure to pluck it out! Another differentiating feature of this book is that the authors haven’t gone for the usually read and clichéd commercial plotlines. Each tale that is told in the further pages is a well-chiselled work of art by the respective writer. We chose this topic after analyzing that the excitement about horror tales among the readers/audience is declining, owing to the fact that the creators are consistently failing to give the readers something fresh.